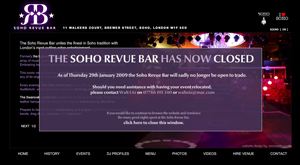 London's late-night entertainment venue Soho Revue Bar closed its doors for the last time yesterday, adding to the long list of venues in the capital that have fallen victim to the crunch. The Walkers Court haunt had hosted events for the likes of the BBC, Sony and Rimmel, and was used as a location for Hollywood sequel Basic Instinct 2. Speaking to independent music and arts site Music OMH, the venue's booking manager Walt Etz said that a buyer for the venue, which entered administration in March 2008, could not be found. Event's calls to the bar went unanswered, but a notice on its website confirms that it is "sadly no longer open to trade". Curious Generation, which promotes live music there, is relocating the events it had planned to other central London venues. The Soho Revue Bar is not the only venue to have closed down in recent months. Rex Cinema and Bar, The Astoria, The End and Chinawhite have all shut their doors for the time being, while The New Connaught Rooms and Great Leighs have been placed into administration.